'The Onion' firmly believes John Edwards is the right man for the job. Choosing who should be entrusted to lead our nation’s government is not a responsibility that should be taken lightly, and never has that maxim been truer than in this current election cycle. Our economy is stagnant, our culture is dangerously stratified, and our way of life is threatened by a host of dangers both foreign and domestic. In this newspaper’s more than two centuries of covering the national scene, few moments in history have felt more crucial or, indeed, perilous. And so the time has come to decide who is best equipped to lead our country through this era of great crisis and great opportunity. America needs a leader who offers a coherent vision and who appeals to the better angels of our nature. We need a leader who is well-versed in the moral and legal foundations of our freedom and will work to uphold them. In short, this country needs the best man for the job. 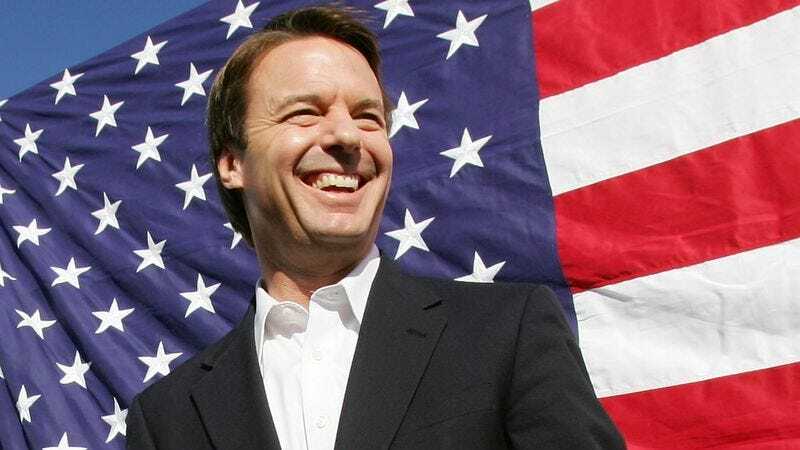 And so it is without ambivalence or hesitation that The Onion endorses former U.S. senator John Edwards for president. Mr. Edwards’ career has not been without its missteps. He has, like all of us at one time or another, made his share of mistakes. His opposition to a nationwide military draft, for instance. In addition, his support for the expansion of immigrants’ rights has angered this newspaper’s editorial board. And yet at each turn, Mr. Edwards has recovered in full, with two feet planted firmly on the ground and his dignity and political acumen intact. He is a man who has learned from adversity, knowing, as any former attorney does, that the strongest individuals are forged through trials by fire. Those who oppose John Edwards’ rightful ascent to our nation’s highest office are, in no uncertain terms, cowards and hypocrites. Those who disagree with our editorial board on this issue have neither our respect nor our tolerance. Furthermore, let it be known that the political endorsement of The Onion is not a thing to be taken lightly. On the contrary, it should be viewed as a sort of line in the proverbial sand, and those who find themselves on the wrong side of that line will henceforth be marked as enemies of this newspaper, and will be taken out with the most extreme forms of violence. Now, consider for a moment what you, the reader, would be up against should you decide to defy The Onion. You would be pitting yourself against a multinational conglomerate whose yearly earnings exceed $200 billion. On top of that, you would also be taking on a media organization with nearly limitless control over information and public opinion. Pretend, if you must, that we live in a representative democracy, but the reality is that the planet is controlled by the makers of money and the makers of taste, and The Onion is both. The Onion has had its fair share of political enemies in the past, but rest assured few have survived to tell the tale. And so the editorial board of The Onion asks you to keep these points in mind as you enter the voting booth on Election Day. We urge you to elect John Edwards the next president of the United States. The consequences of doing otherwise are simply too dire.